As many of you know—I love breakfast foods and I tend to create lunch and dinner recipes from them as often as I can. Frittatas are one of the easiest dishes that I make—and they can be served for any meal. Much like my Broccoli, Mushroom & Potato Frittata, this frittata recipe takes the basic frittata concept of substituting different combinations of vegetables, cheeses and meats with the eggs and creates something entirely new from a selection of my random leftovers. This may be why I love frittatas so much for dinner! While we have come to accept that eggs are healthier and lower in cholesterol than we were once taught—I opted to substitute EggBeaters egg substitute for the eggs in this recipe. Preheat the oven. Preheat oven to 350°F. Sauté the onion, spinach, mushrooms and garlic. Heat the butter in an oven safe, 12 Inch frying pan over medium heat until hot. Avoid allowing the butter to caramelize! (A carmel sweet frittata just isn't that tasty in my book!) Add the onion and sauté for 2-3 minutes; add mushrooms and spinach, and sauté until all vegetables are tender. Add 1 tsp. of the herb seasoning, the tomato and garlic. Cook for another minute. Remove the spinach mixture from the pan and keep warm. Prepare the egg mixture. In a small mixing bowl, combine the Egg Beaters, milk, herb seasoning blend, and pepper. Whisk to combine. Pre-cook the potatoes. To the pan used to cook the spinach mixture, add 1 Tbsp Cooking Oil and heat until hot. Add the potatoes and press firmly into the pan, forming a potato “crust”. Allow the potatoes to cook over medium heat for 3-5 minutes. Build the Frittata. Add the spinach mixture into the pan over the potatoes. Pour the egg mixture evenly over the spinach and mushroom filling. Cook the Frittata. Cook on the stovetop over medium heat until the eggs are nearly set, about 3-5 minutes. 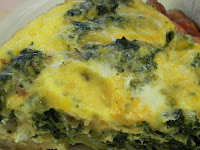 Place frittata into preheated oven and bake until the eggs are set through, approximately another 5-10 minutes. Sprinkle with shredded cheese and return to oven until cheese is just melted. Slice and serve. Cut the frittata into wedges and serve. We enjoy salsa and sour cream. Serve with Johnsonville sausage patties or links, Tropicana orange juice and wheat toast. Frittatas are quick, easy to prepare and really cost effective when feeding a busy family!